Moving right along with the shopping as sightseeing theme, and since we are in the neighborhood it makes sense to take a wander over to Shahpur, an 'urban village' in the south of Delhi not far from Hauz Khas. 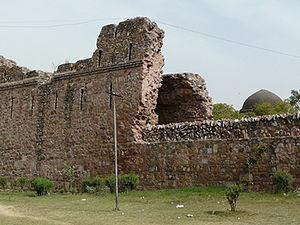 Shahpur Jat (Shah meaning Royal and Jat being the particular caste of people) is within one of the third city of the ancient capital Siri Fort. 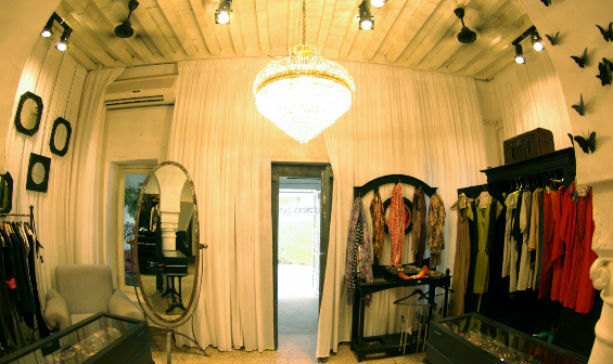 Shahpur Jat is most famous as New Delhi's fashion hub, being home to dozens of boutiques featuring trendy clothes, fashion accessories, and home decor items. Next to the sales of fashion articles, Shahpur Jat is also famous as a production centre with countless buildings in the village being used as small-scale workshops. Best buys in Shahpur Jat include shoes, upcycled clothes at Les Parisiennes, luscious coffee table books at Bookwise, try the Pot Belly cafe for interesting Bihari cuisine. Your real-india driver knows exactly where to take you so if you want to take a break from sightseeing in Delhi or combine it with shopping, eating and dreaming then Shahpur Jat is a place to head! 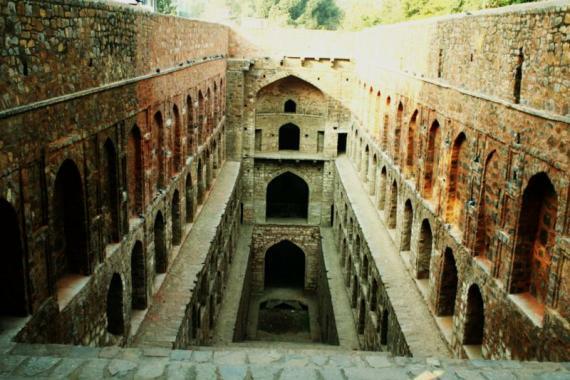 In the heart of Central Delhi, where half the city rushes to work and the other half lazes around in Cafés or tea-bars, Agrasen ki Baoli (step well) comes as a sweet surprise on a hot summer afternoon. 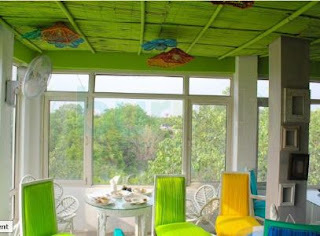 It is a perfect place to steal a quiet moment from your busy sightseeing of Delhi. If you get up early enough in the morning, you might like to check out the daily Laughing Yoga classes that take place here (and other locations around the city). Otherwise Lodhi Gardens offers a green respite from sightseeing in the city of Delhi. Spread over 90 acres, Lodhi Gardens is a serene oasis situated between Khan Market and Safdarjung's Tomb on Lodhi Road and has a restaurant where you can stop for lunch. 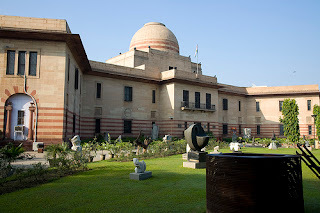 The National Gallery of Modern Art is the leading Indian art gallery. Its collection of more than 14,000 works includes artists such as Thomas Daniell, Raja Ravi Verma, Abanindranath Tagore, Rabindranath Tagore, Gaganendranath Tagore, Nandalal Bose, Jamini Roy, Amrita Sher-Gil as well as a huge collection of Indian miniature artists. A private guide may be hired on request. If you have a limited time for sight seeing in Delhi then head out to Hauz Khas Village where you can shop for art and other funky stuff in a traffic free village amongst some pretty impressive ruins. If you are sightseeing Delhi with Real-India, just ask your driver to take you to these places, he is well versed on keeping our customers satisified! If you spend some time exploring the markets and streets of Delhi, you may wonder what these flying saucer like objects are. Welcome to street food 101 where we introduce you to the various street foods you will find in Delhi and around India. 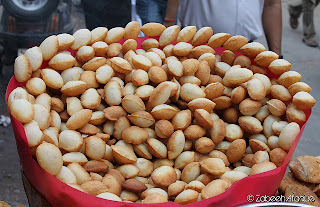 Gol Gappa or Panipuri is a big favourite in Delhi and the only way to eat them is to pop the entire little crisp ball of gol gappa straight into your mouth and wait for a taste explosion like no other. Gol Gappas are the savoury version that has the same experience as eating candy floss. It lands for a nano second on your tongue, flirts outrageously with your taste buds and is gone before you know it. Someone once described the eating golgappa "like a sweet and salty deep kiss exploding in your mouth, inside out and in slow motion." Made of whole wheat or sooji flour the golgappa is a round, hollow puri, fried crisp and filled with a mixture of water, tamarind, chili, chaat masala, potato, onion and chickpeas. It is small enough to fit completely in one's mouth. They are best experienced in street stalls where they are stacked inside a glass case to be protected from moisture. Golgappas are found in every market, including the bigger ones like Chandni Chowk, South Extension, Sarojini Nagar and Sadar Bazaar but be warned, the vendor will keep serving you until beg for mercy! According to the constitution of India, the country is a secular republic. Indian citizens are free to follow any religion and faith. Indians worship different Gods in many different ways. Religion with its rituals and philosophy forms the life style of any average individual born and brought up in India. India has also created a platform for many religions from all over the world. However the main religions of India are Hinduism, Jainism, Sikhism, Buddhism, Islam, Christianity, Zoroastrianism and Judaism. 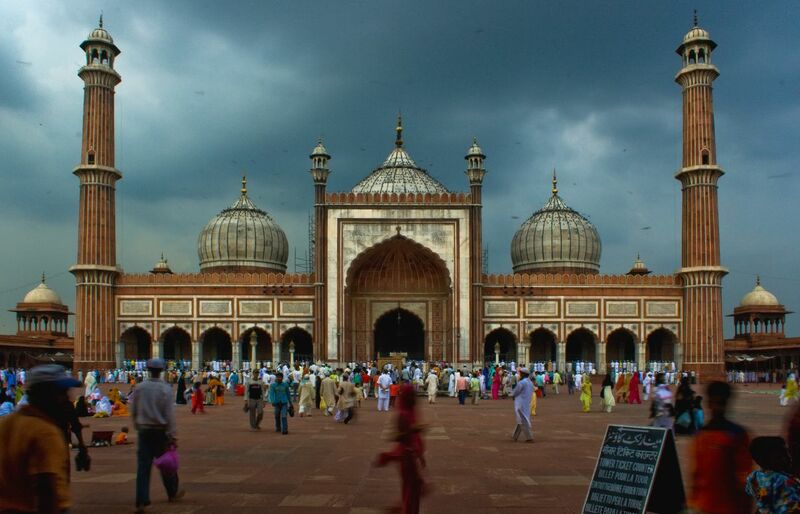 Here are some more interesting temples and mosques to put on your Delhi Sightseeing list that you won't find on your standard Delhi itinerary. That's because Real_India wants you to help make your holiday in India a unique memory of a lifetime. 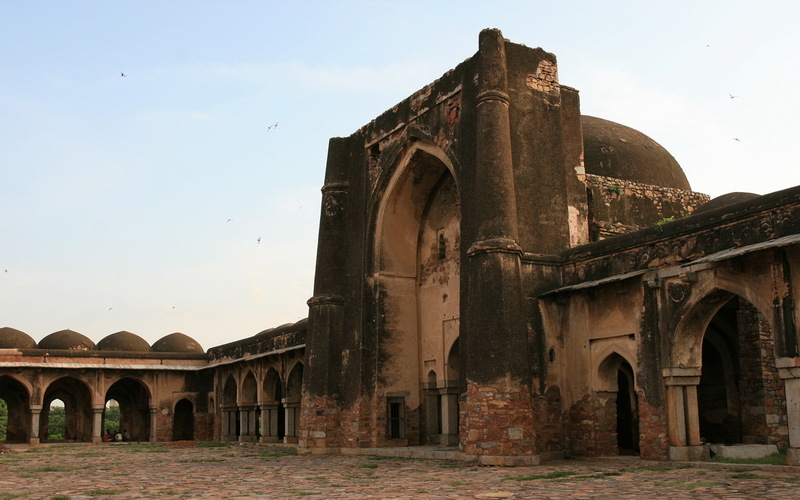 Built in the early 16th century, Nili Masjid is one of the most important mosques in Delhi. This masjid was constructed by a nurse named Kasaumbhil. It is located inside the Hauz Khas enclave on the road that connects Aurobindo Marg and Khel Gaon Marg. 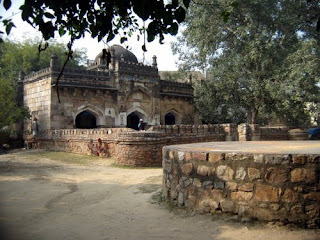 The mosque was built under the supervision of Sikhander Lodi. Located near Aurobindo Ashram on Sri Aurobindo road in Begampur near Delhi, Begampuri Masjid is one of the largest mosques in the city. It was built by Khan-i-Jahan, the son of Firuz shah’s Prime minister Muqbal Khan in the 12th century. The mosque today stands to remind us of the famous Begampur. It once served as an administrative center, a place of worship and a madrasa. Now only a handful of people know about this mosque. Its' the kind of place to wander around and soak in the atmosphere. The buildings speak of grandiose planning; the idea was to encompass all the Delhis before it in one all-embracing fortress. However like most ideas of Muhammad-bin-Tughlaq it defied all practical steps taken to make it a reality and Jahanpanah was left as it was when about halfway through. 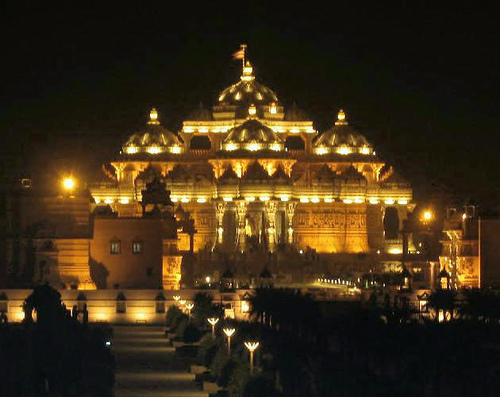 Swaminarayan Akshardham is a unique complex that introduces Indian culture, heritage and values. The main temples architecture is absolutely amazing and something for everyone to admire as it is carved from stone with the most defined detail. The temple is surrounded by fantastic gardens and ponds. The exhibitions at Swaminarayan Akshardham are a must see. This is where foreigners can learn about Swaminarayan, what it is to be a spiritual leader, the history of India and the values of the society. This is done via a movie (on massive screens) and a light and sound show of robotic figures outlining Swaminarayan's life. There is also a boat ride through a display of 800 statues oulining India's heritage. It will easily take up the whole day! Yusuf Sarai is a traditional Gurudwara in the Green Park community, Delhi. There you can admire beautiful architecture and small but amazing sculptures. It also offers a small library. Jagannath Temple is located in Green Park on Aurobindo Marg, New Delhi. This temple was constructed by the Oriya people whose favorite God is Jagannath. There is a world famous Jagannath temple in Orissa. 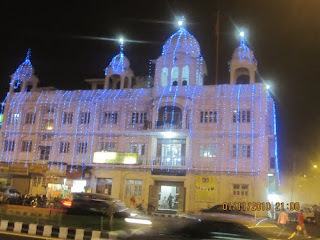 The Oriya Community in Delhi built this modern Jagannath temple to fulfill their spiritual needs. 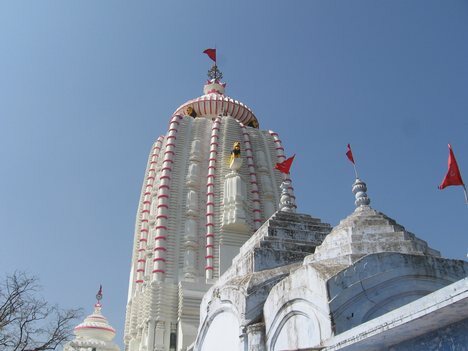 The temple features huge idols of Lord Jagannath, Lord Balabhadra, Subhadra and Sudharshan. These idols were brought from Puri, Orissa. This temple is famous for its Rathyathra festival held every year in the month of July. The Oriya people and others celebrate this festival in a grand manner. It is believed that Lord Jagannath comes to visit his home during this time. The temple offers Prasad everyday to devotees. 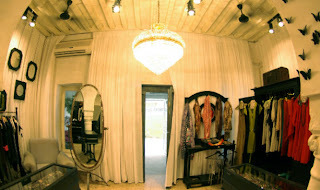 Enjoy the serene and calm ambience. You can spend some quiet moments away from the bustling, noisy city. A visit to the Jagannath temple in Delhi is a spiritually rejuvenating experience. The temple serves as a place of congregation the Oriya community in the capital city. You can book your room and Prasad in advance. 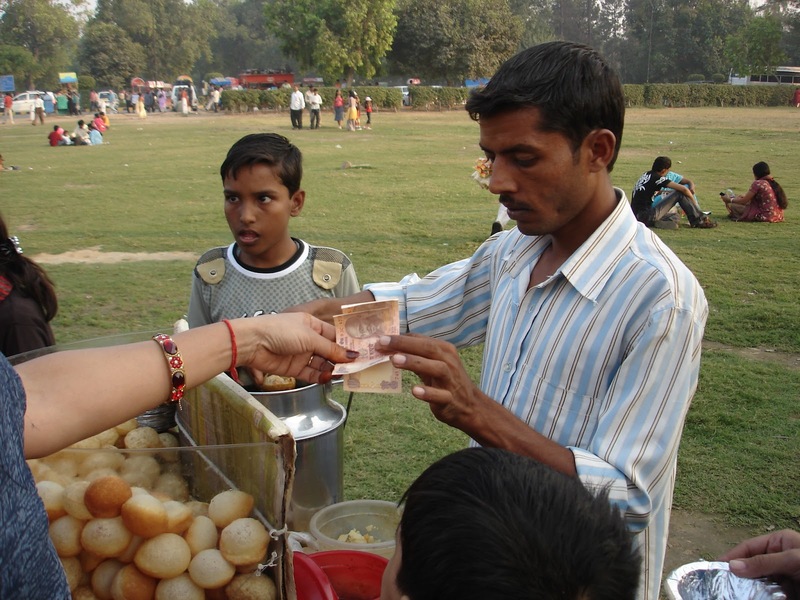 The temple organizes many charitable events with the help of enthusiastic devotees. Free lunch is distributed to the poor every day. Blood donation and health check-up camps are organized by this temple periodically. Do not miss a visit to Jagannath temple on your trip to Delhi. Delhi, 15 Million People can't be wrong! 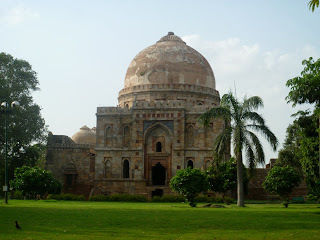 Interested in some of the more unusual aspects of sightseeing in Delhi? Away from the usual tourism suspects, there is always more to discover in the city. The Hanuman Temple in Karol Bargh is one such place. Situated in the heart of Indian capital city, New Delhi. 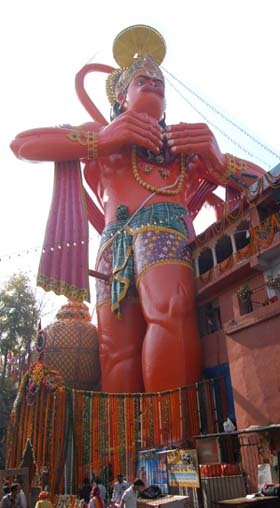 Karol Bagh's 108 feet Hanuman temple is a unique mix of artistic sculptures and sanctity. Hanuman is the hero of the Indian classic epic the Ramayana, and symbolises devotion and courage, he is a very popular god in India. Apart from his endless devout towards Lord Ram the god of enormous strength Lord Hanuman is also known for his unmatched mascularity and intelligence. Hanuman temples are spread all around India with devotees flooding into it for paying homage to their monkey-god. But this temple is unique both in location (Hanuman towers over the Metro line as you can see in the photo below) and in style. Located in-between a busy portion of the city, the temple relieves its visitors from day-to-day tensions, healing them towards a relaxed mind. The temple houses a gigantic, 108 feet high idol of lord Hanuman also visible from the nearby metro rail lines. The temple was built in 1994 by a departed priest Nagababa Sevagir Ji Maharaj with several changes made later on to reach its present form. 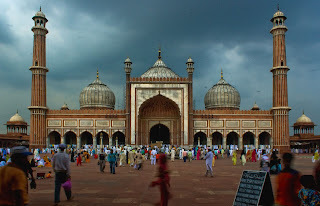 If you have booked your Delhi sightseeing with Real_India, you can ask the team to add this to your sightseeing list of Delhi.